When our faith was tested with ectopic pregnancy in 2012, I caught myself strongly believing the possibility of not having a child ever again. You see, it's not a simple EP issue that can be treated by Methergine. Sure, I took that med but the doctor cut my right fallopian tube where a 6-week-old baby blood got stuck. Therefore, giving me only 50% chance of conceiving again. Many times I cried alone just thinking about that. The desperation and depression got worse months after. I blame no one for what I felt but you know, the society we have is cruel to moms. Sophia was four when it happened - the age people think a kid is ready to have a sibling. People were insisting that we should give our only daughter a sibling so she won't be sad. I remember how affected I was then. There were times when I asked my husband, R if he really liked to have another kid. It was my way of convincing myself that it's still okay if he would say no. Thank God R never requested for a new baby. He said that he will just accept whatever God will give us. Despite that assurance from my husband, a monthly period had always stressed me out - well, on a monthly basis until I reached the point of acceptance. I forgot when but it still came eventually. I think it was when I stopped listening to what others have to say about our lives; that is, "it's happier to have more kids." Ugh, that remark still annoys me up to this day, to be honest. Seriously, why would the number of kids or lack thereof become the basis of a family's happiness? People should stop believing that they can give their opinions whenever and to whoever they want. Glad that I'm now the kind who no longer take BS from anyone especially naysayers. In the years of trying my best to still choose positivity over the myriad of troubles that came our way, I have also learned to only pick the battles that are worth fighting for. I guess, that was when God thought I was ready to take this beautiful challenge of having another child. 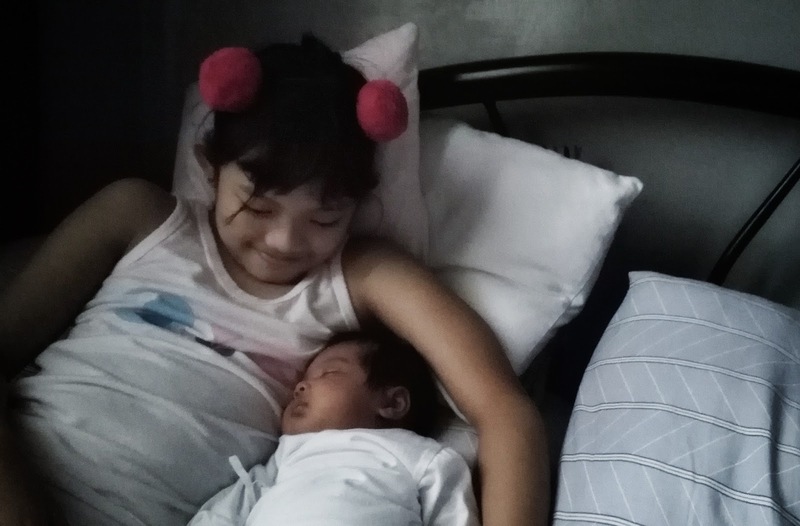 Perhaps, He thought that being a full-time mother is something I can really be good at. Maybe He was thinking that having a new baby is the kind of success that I can fully control. Oh, I should stop guessing. 'Cause the truth is, I may not have asked for it but our firstborn Sophia did. Hence, we named her baby sister, Samantha, which means - God heard. Blessed by how you both trusted God on this. God is sovereign! I am indeed excited to see you, Sam!